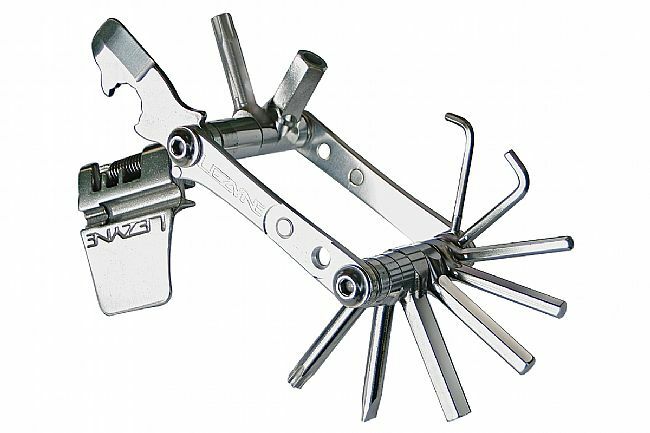 The V-16 Multi-Tool from Lezyne features machined aluminum side plates, an integrated magnetic quick link holder, a tire lever and 10mm wrench, stainless steel tool bits (2, 2.5, 3-6, 8mm, and T25/30), a flat head screwdriver, and a chain breaker with spoke wrenches. Hex: 2, 2.5, 3, 4, 5, 6, and 8mm. Spoke wrenches: Mavic MTB, 3.22, 3.45mm. Tire lever: open end 10mm.